Hello, want a nice and quiet place? 5 minutes walk from the very pretty and authentic 'Hameau de Dardennes' of its river, its old wash house, small bar and Boules ground, this stone country house of 1819, on an old Provençal Domain opens its doors. . Its 8x4 pool and shaded lawn are ideal for resting. With a large living room, a large terrace, 4 bedrooms, one in a cottage by the pool, this house also has a laundry room and a summer kitchen with gas barbecue. 5 minutes walk: a small grocery store, pharmacy, bakery, bus and other amenities. For children we are near the Zoo Faron and Cable Car Toulon. Nous avons passé 15 jours dans cette maison, avec enfants et chiens et ... Séjour très agréable et reposant. Plein de choses à visiter autour de Toulon, la maison est très centrale. L'accueil de Yann est formidable, la maison accueillante et chaleureuse. We stayed 2 weeks in Yanns lovely house. The house has all you need to spend your holiday and especially the pool and the outdoor area was great. The rooms were very warm during nighttime and the ventilators was working hard to keep the temperatur down. Airconditioning would have been nice. Apart from that, we enjoyed our time in the house and Yann was a very helpfull host. Nous sommes partis an familles dans cette belle maison agréable spacieuse où chacun à son espace de vie. Terrasse et piscine magnifiques. Un lieu calme et reposant. We had a wonderful week in France. A cozy patio and a large pool did that several times went back early from the beach to get some time at home. Both we and the kids enjoyed it. Each morning we took a walk to the local bakery and bought bread. 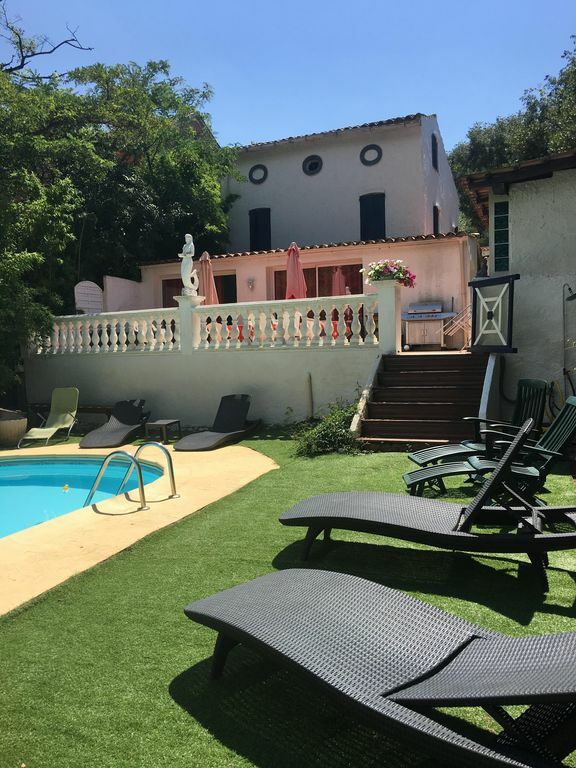 5 km from the Mourillon beaches of Bandol and Hyères and near a river and a lake 10 minutes, this house makes you enjoy a multitude of activities. Apart from water sports, you can enjoy the amusement parks, kindergarten, Cable Car and Mount Faron Zoo.